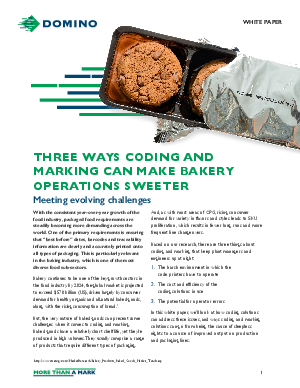 For manufacturers of baked goods and snacks, the need for flexible, high-quality coding and marking solutions has never been greater. The wide array of packaging types and materials already in use today — combined with the SKU proliferation driven by consumer demands — means manufacturers have to print expiration codes and lot numbers on multiple substrates in multiple areas/orientations on their packaging lines. These codes need to be clear, precise and readable by both humans and machines to ensure customer safety and satisfaction. They must also provide traceability in the event of a recall. This white paper from Domino looks at the types of printing technology available today and discusses their various advantages and disadvantages in bakery line applications.